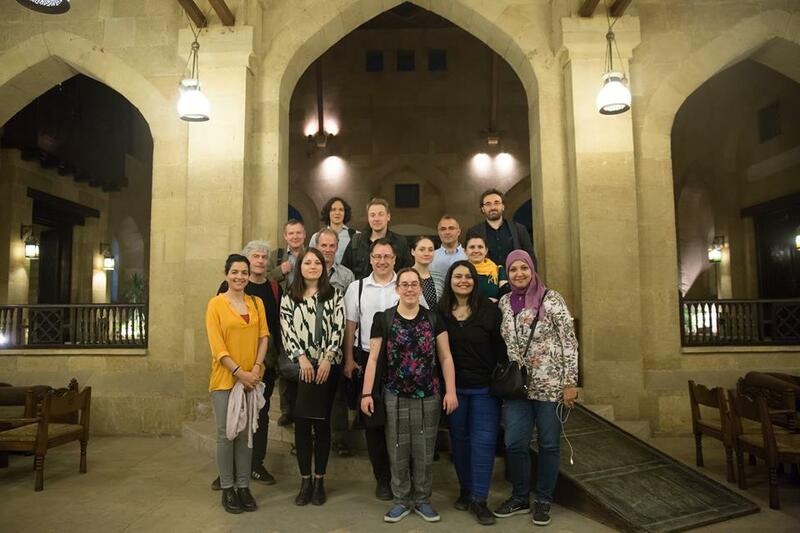 I recently received an opportunity to represent the UK media (more namely The Huffington Post, where I'm a contributor to their blog) in Cairo, Egypt as part of their press trip with the EU Co-Operation in Egypt, showcasing what the EU and its delegation have done for the country. It was a rather packed 3 day schedule, with visits to different projects and briefings about each days' events, but was very enjoyable and all the other European journalists who went on the trip were all lovely, here we all are pictured at the last nights' dinner above. Upon arrival in Cairo, I was transported to our first of two hotels - the Conrad in Cairo, which was just beautiful and very luxurious. All the staff were lovely and very accommodating, even though they tried to make me pay the hotel bill that the travel company were covering, thank god for the fixers (local people who travelled with us and helped us out) who got me out of it! Day 2 started at 8am with a meeting at the EU Delegation, learning about all the different economic and social projects that Egypt as a country have partnered with the European Union on, all of which were very interesting and added a new dimension to a country that I didn't really know much about. Especially the Sanitation projects, as the clean water is scarce and could run out quickly so could be in crisis very soon. We also had an hour's meeting with the Egyptian Ministry of Foreign Affairs but the entire conversation was off-the-record I can't divulge into anything he said unfortunately. Meetings over we headed to Faiyum, a city in Middle Egypt that's 2 hours from Cairo but goes past the Giza Pyramids. I got the best pictures I could but we approached them from the town side, so there were lampposts in the way I'm afraid as you can see below. Once in Fayium we visited a couple of community projects, one being a school that offers training and employment for the city's youth to become pre-school teachers and help educate Fayium's children. I took quite a few pictures of the children but due to security reasons, I won't put any of them up here, but here's one of the great teaching that goes on within the nursery. The children even sang us a song (along with the teachers obviously) and that really made me smile. Again, like everyone in Egypt really they were all really lovely and welcoming, making a fuss over us and making sure we had everything we needed. Since this was such a remote area and not many of the teachers spoke English or very little, we had some great interpreters for interviews. I didn't need to use them but for the presentations they were very knowledgeable and effective. After visiting the school we got back in the bus and headed over to a Non-Government Organisation project, from the Community Development Association in the village of Naqalifah that helps women raise awareness of lots of issues - they're paid to do this, giving them both employment and the chance to have their voices heard within the community. A particular issue I took away from it was the importance of FGM education. I actually wrote a piece for The Huffington Post about this, so go and read that HERE. The visits were so educational to me and really opened my eyes to the problems faced but also opportunities being offered to the citizens of Egypt, as well as the social and economic projects being prioritised by the government. We then got back to Cairo, not before going for a lovely dinner on the last night (the first picture was from that night) and the mesmerising view from the hilltop along with prayer being initiated at the mosque just made my trip feel even more complete. Below are some pictures of that lovely view. After a great few days, it was time to head home the next morning, with my flight being early so I didn't really get a lot of time to explore this magnificent city and country. I hope to come back soon though and experience more of Cairo and it's surprises. I'd like to round off this post by saying thank you to Andre Walker (check out his great work for The Observer HERE) for putting me forward for the trip, as you can see I had a great time! Also feel free to 'Like' my Facebook page to see what I'm up to.